Medusa! Run before she turns all your reels into stone and increases winning possiblilities for you. Enjoy amazing spins and bonus features, all in store for you! Discover the popular Greek mythological character of the gorgon on Medusa Slots. This superb game from NextGen will lead you to a Greek temple where you can stare in the eyes of Medusa and win huge prizes. 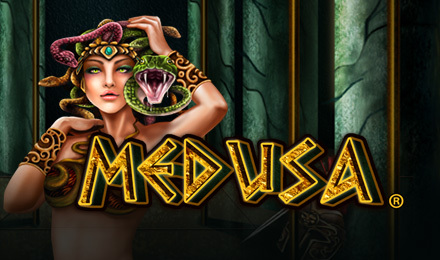 With a 96.46% RTP, Medusa Slots will keep you at the edge of your seat. Consisting of 5 reels and 25 paylines, the game is loaded with numerous thrilling features such as Turn To Stone Re-Spins with Expanding Wilds, 10 Free Spins with the Once Bitten Bonus, Pegasus Bonus with prize of up to 50x and a Super Spins Feature where all winnings are quintupled!